To date, we have raised $282,582 for Santa Fe! Look what a great group of generous and thoughtful women can do when they put their minds to it! Our mission is to help our community by having 100+ women contribute $100 per four times a year, that’s $40,000+ annually, to local charities. All charities and organizations up for consideration must be in the Santa Fe area. The idea is to keep it local and have an impact that we can see in our community. If $100 is too steep, bring friends and join as a team. 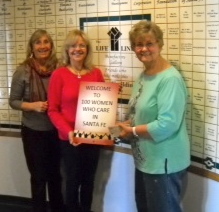 Become one of the 100+ Women Who Care in Santa Fe and be a part of something wonderful! At our 29th meeting on February 6, 2019 we raised a total of $20,035. We voted to support Healing Voice-Personal Stories and raised $10,302. & Kitchen Angels which received $1,800 from our Business Sponsors. At our 28th meeting in November 2018,we raised a total of $20,151. We voted to support STEM Santa Fe . We collected checks for $12,051. To our 2nd place winner Life Circle we gave $6,900. 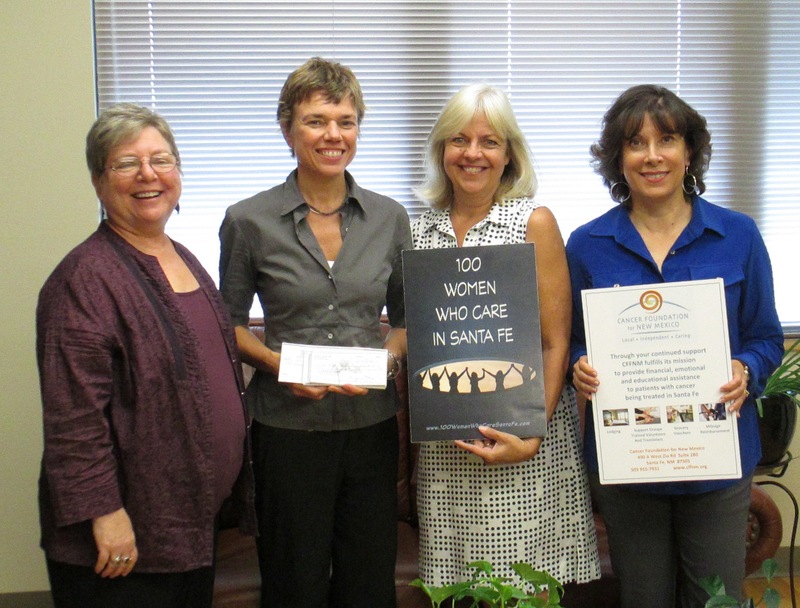 To our third place winner, Community Palliative Care of Northern New Mexico, our business sponsors gave $1,200. At our 27th meeting in August 2018, we raised a total of $17,530. We voted to support Alternatives to Violence Project of Northern New Mexico. We collected checks for $10,171. To our 2nd place winner Girls on the Run we gave $6,159. 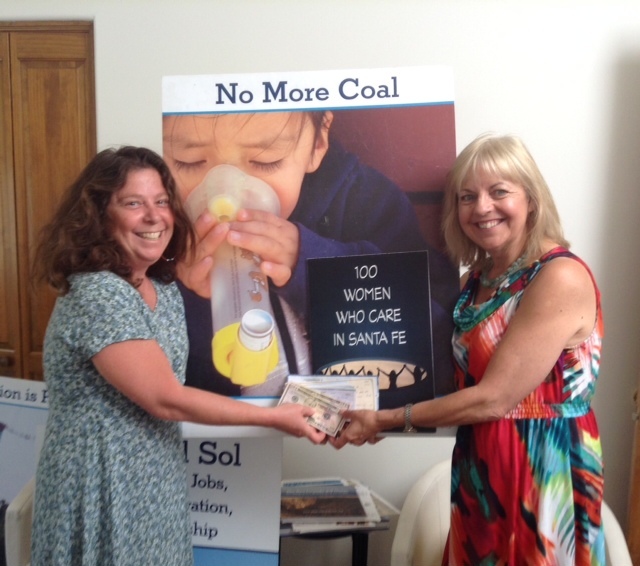 And to our 3rd place winner, First Serve New Mexico our business sponsors gave $1,200. At our 26th meeting in May 2018, we raised a total of $19,409. We voted to support The Santa Fe Recovery Center. We collected checks totaling $10,000. To our second place winner, Feeding Santa Fe we gave checks totaling $8,109. To our third place winner, Santa Fe Farmers Market Institute, our business sponsors gave $1,300. We voted to support SFPS Adelante. We delivered them checks totally $10,516! To our second place winner, Reading Quest, we delivered checks totaling $5,225! And to our third place winner S.E.E.D.S our business sponsors gave $600. At our 24th meeting in Nov. 2017 we raised a total of $14,650. we voted to support CASA First. We delivered them checks totaling $10,000! We had a 2nd place winner…The New Mexico Center for Therapeutic Riding. We delivered checks to them totaling $4,050! To the third place winner, Match New Mexico, our business sponsors gave $600! At our 23rd meeting in Aug. 2017 we raised a total of $13,152. We voted to support The Waldorf School Native American Scholarship Fund. We delivered them checks totaling $8,792! And we had a 2nd place winner…The Santa Fe Animal Shelter. We gave them $$3,460. To the third place winner, The Santa Fe Prom Closet, our business sponsors gave $900! Making our total donation $13,151.67! At our 22nd meeting in May 2017 we voted to support Resolve/Impact. We delivered them checks totaling $11,600! At our 19th meeting on August 3, 2016, we voted to support Coming Home Connection. We delivered them checks totally $10,340! At our 18th meeting on May 4, 2016, we voted to support Interfaith Community Shelter. We delivered them checks totally $10,250! At our 17th meeting on February 3, 2016, we voted to support New Mexicans to Prevent Gun Violence. We delivered them checks totally $10,025! At our 16th meeting on November 4, 2015, we voted to support Carlos Gilbert PTK. We gave them checks totaling $9,550. 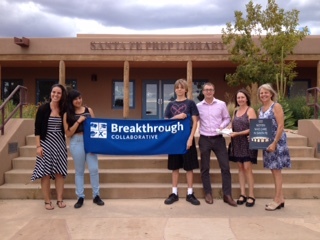 At our 15th meeting on August 5, 2015, we voted to support Breakthrough Santa Fe and gave them checks totaling $8,125. 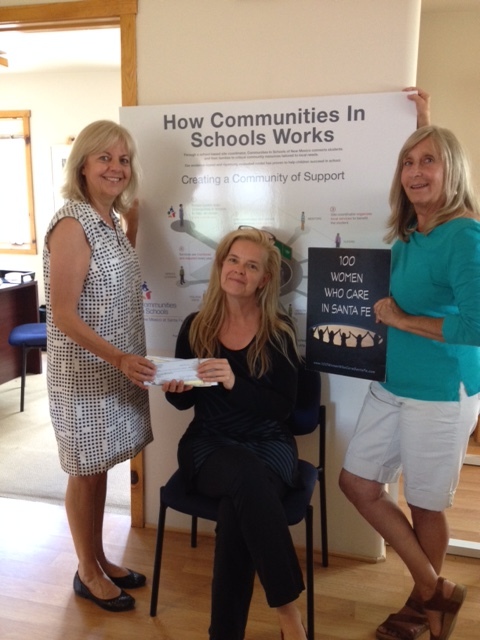 At our 14th meeting on May 6, 2015, we voted to support Communities in Schools and gave them checks totaling $6,725. At our 13th meeting on February 4, 2015, we voted to support Interfaith Leadership Alliance and delivered checks totaling $8,125. 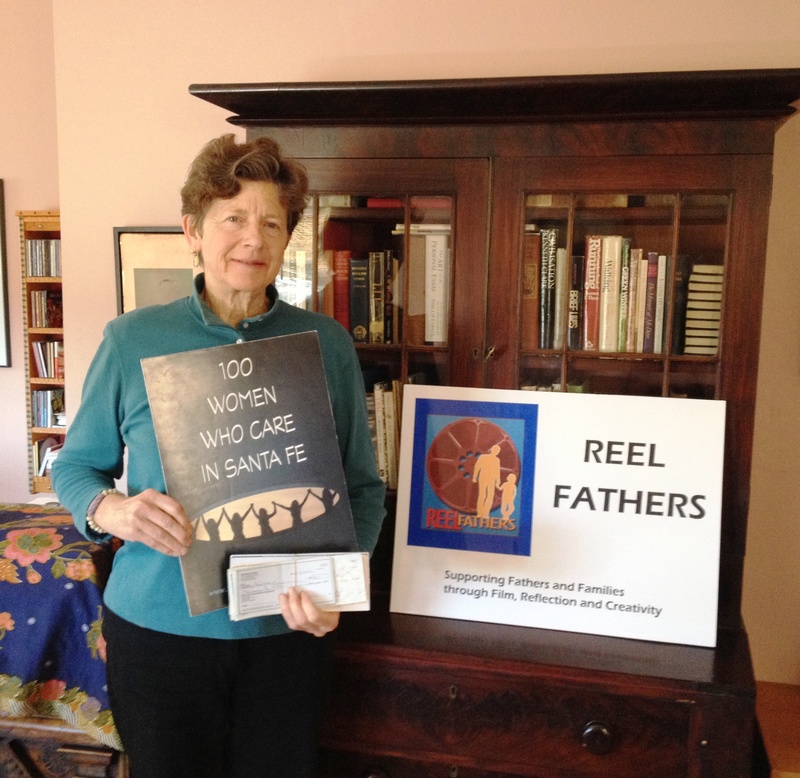 At our 12th meeting on November 5, 2014, we voted to support Reel Fathers and delivered checks totaling $5,375. 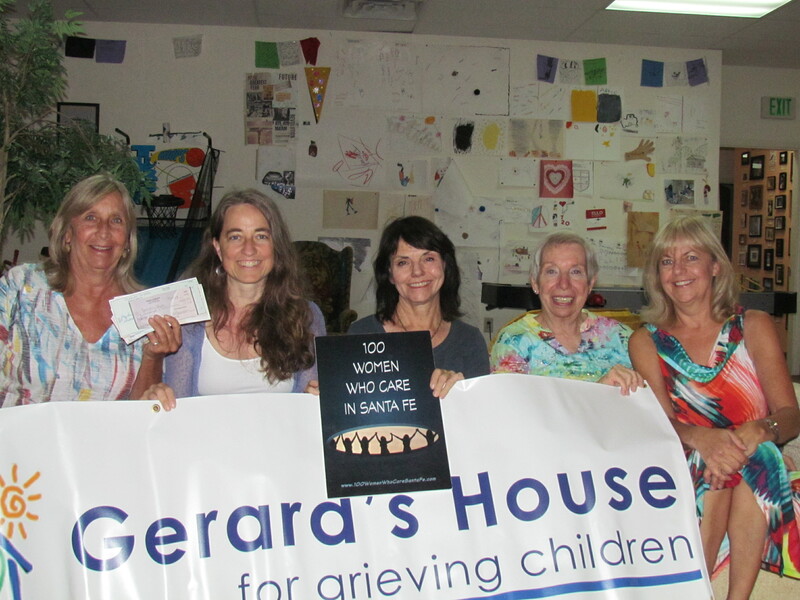 At our 11th meeting on August 6, 2014, we voted to support Gerard’s House and delivered checks totaling $6,350. At our 10th meeting on May 7, 2014, we voted to support New Energy Economy and delivered checks totaling $6,475. 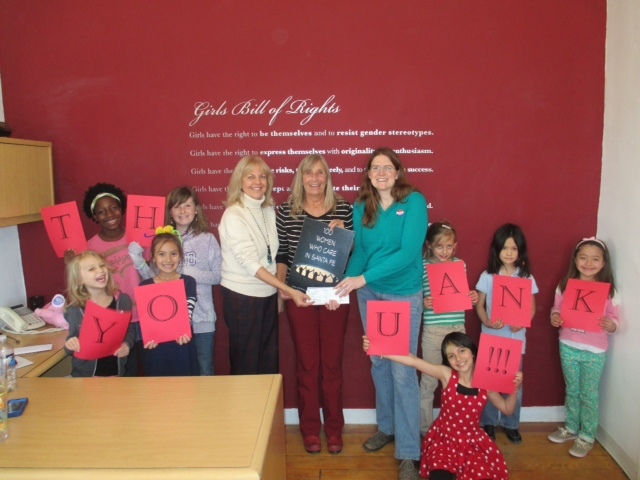 At our 9th meeting in February 2014, we raised $5,800 for Girls Inc. of Santa Fe. 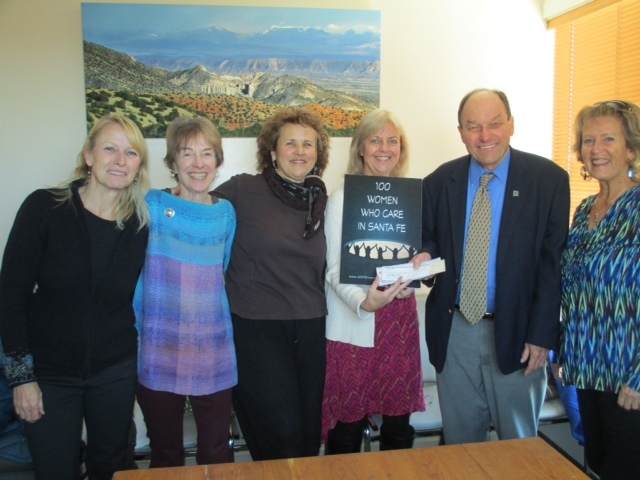 At our 8th meeting on November 6, 2013, we raised $6,200 to support the New Mexico Environmental Law Center. At our 7th meeting on August 7, 2013, we raised $6,125 to support Cancer Foundation of New Mexico. 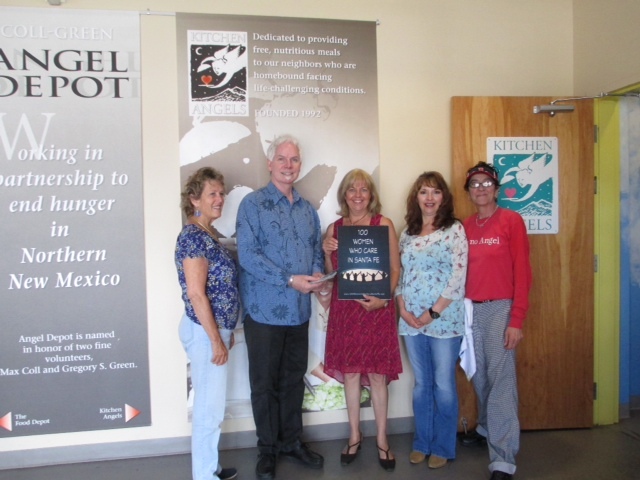 At our 6th meeting on May 8, 2012 we voted to support Kitchen Angels and raised $5,800 for them. 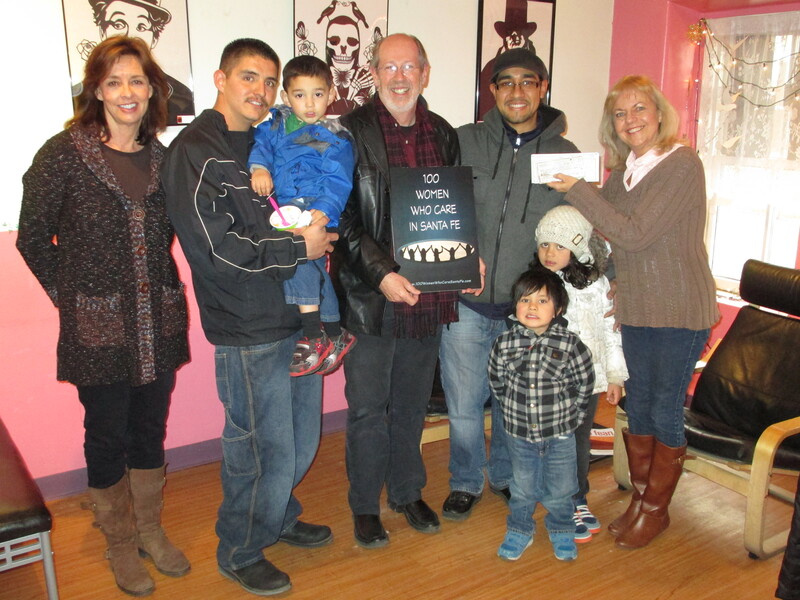 At our 5th meeting on February 6, 2013, we raised $6,000 Young Fathers of Santa Fe. 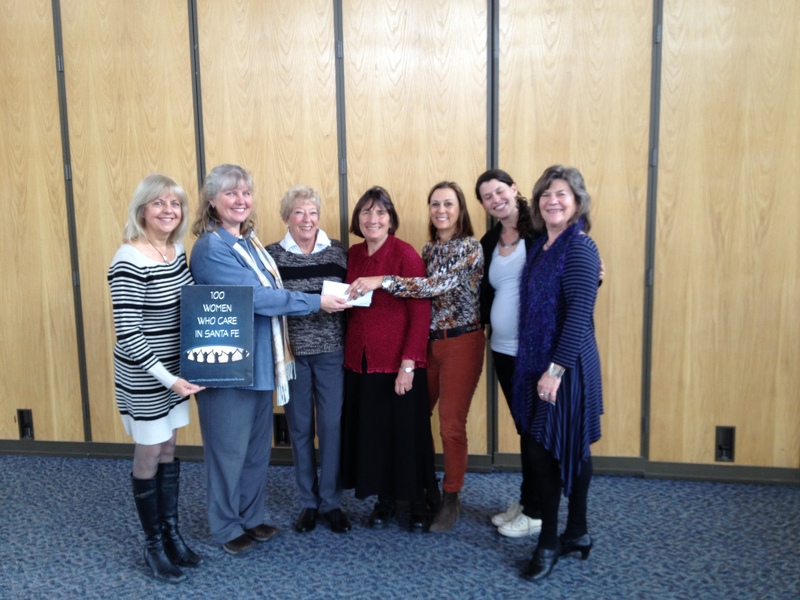 At our 4th meeting on November 6, 2012, we raised $5,400 for the New Mexico Suicide Intervention Project. 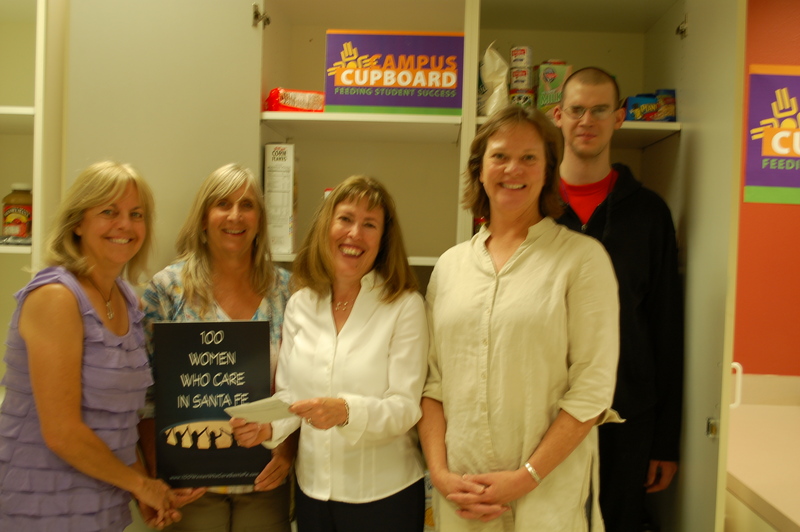 At out 3rd meeting on August 1, 2012 we raised $4,700 for Santa Fe Community College Campus Cupboard. 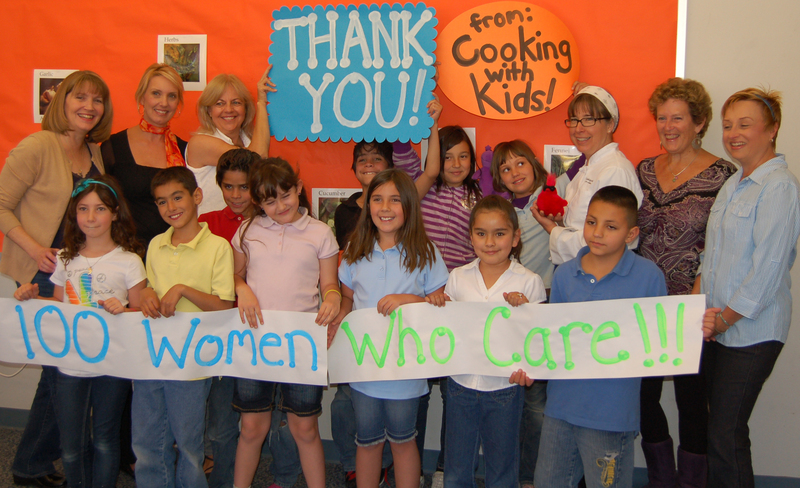 At our 2nd meeting on May 9, 2012 we raised $4,200 for Cooking with Kids! At our 1st meeting on February 8, 2012 we raised $2,500 for The Life Link!